I like to think I have a creative brain. Sometimes it doesn’t come in the form I’d like, or when I need it, but when it starts freewheelin’ I try to roll with it. This week, my inspiration was packaging. I recently purchased a jar of peppermint sugar scrub from Casey who owns a shop called Artisan Loft. I have to tell you, that stuff is a-mazing. It smells delicious, and my armadillo elbows are touchable now. 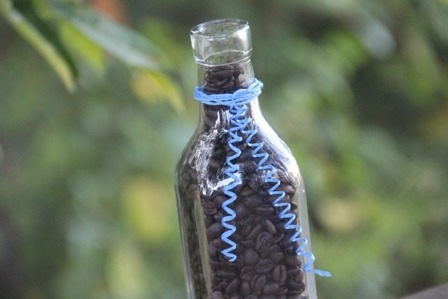 What lead to this project though, is the pretty blue baker’s twine that was tied around the jar. I was playing with it after I took it off, thinking about what a nice shade of blue it was and I started wondering if twine could be curled. After what my husband called a “Mad Science Experiment” I can tell you – it can. I considered using glue or wire, but I was afraid it would be too stiff. The best plan seemed to be to starch it. I had a can of spray starch in my sewing room that’s somewhere around 137 years old. I can’t remember the last time I even used it. In hindsight, I probably shouldn’t have been in the room when that stuff was sprayed, but the dizzy spells seem to be fewer (kidding!). I tried my experiment with that can until the sprayer stopped working, but it turned out that plan B worked better anyway. Don’t worry, the ancient spray starch is gone now. For my own safety, I went with homemade starch. To make it, mix 1 cup water and 1 level tablespoon of corn starch in a glass measuring cup and microwave it for 2 - 3 minutes. Mine boiled over, and came out a little thicker than I expected, but it worked beautifully. After the starch cooled, I submerged the baker’s twine in it. As I pulled it out, I pinched it between my fingers to remove the excess. 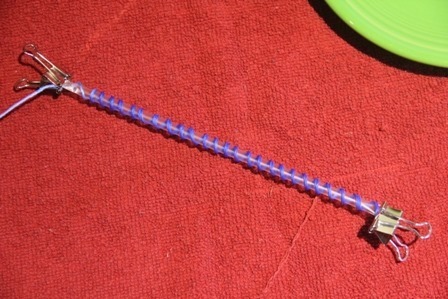 Clip one end of the twine to a straw with a binder clip. Wrap the wet twine around the straw, spiraling down toward the other end. Clip that end with a second binder clip. Leave it for 2 – 3 hours, or until completely dry to the touch. Remove the clips and slide the twine off the straw. It worked! To compare, the top twine is the homemade starch and the bottom is using the (old) purchased spray. I also tried this with a small stirring straw, like you’d find on a coffee bar. It worked just as well, and made cute, tiny spirals. This is it, compared to the regular straw curls. To leave some straight so I could tie a bow, I doubled a piece of twine and twisted the ends around a straw side by side. Next time, I would use two separate straws, as the twine stuck together a bit and lost some of its curl when I had to pry them apart. Leaving the straight section for a bow worked great though. As experiments go, I’d call this one a success. The method worked well, and it was kinda fun. In my research I found a few people suggesting making starch by mixing one part vodka and two parts water, but I was afraid that might turn out to be a little TOO much fun. Curl all the twine!